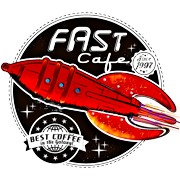 The Re-launch of FastCafe, in a fresh new spaceship! Welcome aboard fellow coffee lovers. Today, FastCafe.com is launching a fresh new look! The new site is far superior and I hope that you enjoy the new experience with FastCafe. Feel free to say hello, leave a comment, give a suggestion, or offer some feedback. The fresh new design is warmly welcomed after the previous 7 years with the old HTML layout. This is Captain Kimo. Did you know… that we travel through space at just a fraction of the speed of light. The milky way galaxy is a ginormous, full of many things. As far as our technology, research, and exploration can determine, the best coffee in the galaxy is here! So, if you consider Earth a spaceship, (we are travelling on it, through space…) then we’re in the same boat, er ship! Anyways, welcome to the NEW FastCafe.com! ← NewerAdventures of Captain Kimo!